Our prices include Free Delivery. No charge for credit or debit cards. Our traditional postcards are printed in full colour one side with black on the reverse. They are printed on a 300gsm TruCard and finished with a gloss lamination on the full colour side, the reverse is not coated and so easy to write on with any type of pen. Azimuth Print, the go-to name for all your postcard printing needs. We can supply high quality, cheap A6 postcards that will help you market your business or yourself effectively! Printed on glossy stock, our printed postcards give the option of full-colour printing on the front and black-and-white on the back. Postcard printing remains one of our most sought after printing services. Not only do printed postcards make brilliant promotional tools, but they offer superb value for money. Printed postcards are a great addition to any marketing campaign. They are well suited to estate agents, night club promotions, product and sales promotions, they can also be used as information cards. Postcards are also a fun way to spread special news too, maybe you have a wedding, party or other special event coming up and want to create a non-traditional invitation. Birth announcements can also be printed on postcards with a photo of your new arrival. Our postcards are great for reselling too if you are a souvenir shop, newsagent or tourist attraction. You can also print you portfolio onto postcards to raise awareness of your work and send out to possible clients. 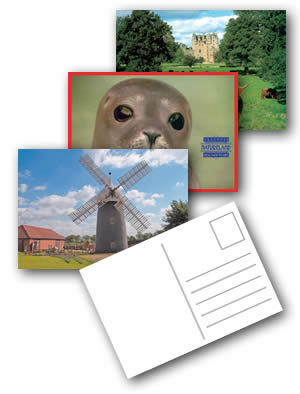 When you print postcards with us, you are guaranteed a high quality, yet affordable product.